Bonnie Bachelor - "Boss Bonnie"
Bonnie Bachelor is a credentialed teacher, with 11 years of educational experience in grades kindergarten through fifth and has been providing her summer camps for the last 9 years. Bonnie&apos;s background in education, business, and psychology is the perfect recipe for success. Bonnie&apos;s goal is to empower children to be lifelong learners by developing confidence through shared experiences and mutual encouragement through teamwork, independence, and learning IN THE KITCHEN!!! Anne Fluor Scott has been a certified Chef and Pastry Chef for 11 years. Upon completing her culinary school education, she did an apprenticeship under a world renowned chocolate and sugar artist, training for showpiece competitions. After moving back to Southern California, she started her own personal and private Chef business which she ran until she got married. She currently resides in Mission Viejo with her husband and three daughters who&apos;s ages range from 6 to 22 months. She is happy to be a member of the Culinary Kids family and looks forward to working throughout the summer and school year teaching eager young chefs to take charge in the kitchen. Lynda Bachelor is a retired elementary educator of 34 years. Lynda loves teaching and the kids love Lynda! When not teaching she loves to travel, especially to Europe, volunteer at her church South Shores Baptist, and spend time in her rose garden. Lynda has been teaching with Culinary Kids since 2010. Barbara Bonner was a speech therapist before raising four children of her own. Now, she is the proud grandma of nine grandchildren, six boys and three girls. When she&apos;s not spending time with her grandchildren, she&apos;s working in her backyard garden or researching new recipes to make in her home. 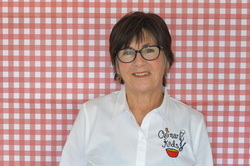 Barbara has been teaching with Culinary Kids since 2012. Faye retired after 25 years in the medical field. She now enjoys sharing her passion for cooking with children. It’s fun to show kids that preparing food for themselves and others can be as much fun as eating it. When not preparing food or showing children how much fun it can be in the kitchen, she trains and competes in Agility with her English springer spaniel dog “Missy.” She also enjoys taking Zumba and cooking classes as well as going for walks with her husband and dog. Teresa recently retired after 32 years in the grocery business. Since then she has worked with a private catering company and has prepared weekly meals for clients. She has spent most of her life in South Orange County where she and her husband raised their 3 children. She now has 2 grandsons whom she loves to spend time with. Teresa enjoys her family, cooking, entertaining, camping, and reading. She finds great satisfaction in sharing healthy recipes and teaching the younger generation how to create delicious wholesome meals. Staci Rozas was an elementary school teacher and then became a substitute teacher and private tutor while at home raising her three children. Staci also works part time at her church overseeing the childcare ministry. As her children grow up and leave home she especially enjoys opportunities to work with young children and can&apos;t wait to spend time in the kitchen together! After many years in medical device sales, Allison is now a proud “domestic engineer” overseeing her busy family of five. When she’s not running around with her three monkeys, she enjoys sharing her passion for cooking with young chefs and enjoys introducing new foods to each and every one of them on fun, culinary adventures!